Notable qualities of the mummies include the finely woven textiles that cover them, the fetal position they are all bound in and the fact that apparently they all face east in the tombs. I say apparently because the graves were robbed and later restored, so how we can know that all the mummies faced east? Maybe only certain ones did – dignitaries, women, peasants, who knows? There is also a theory that the very long haired mummies were the shamans or priests of the community, but I am not sure what support there is for that theory. In addition to the dead, the tombs contain animals, pottery and other artifacts, including seashells. Regardless of what we don’t know, the cemetery is an incredible, albeit morbid, sight. Preceding the Incas and the Nazcas were the Paracas, who lived in the Ica desert between 1300 BC and 200 AD. Before heading to coastal Paracas to continue our vacation, we also saw some Paracas lines, which differ from the Nazca lines in that they are situated on the side of hills and depict humanoid figures instead of animal and geometric shapes. The Paracas also are known for skull binding from birth until about age 8, which would create elongated or oddly shaped skulls believed to identify tribes, and brain surgery (not sure whether such surgery was necessitated due to the skull binding). You guessed it – elongated heads and sand drawings – a theory that the Paracas were extraterrestrials also exists! Next: We hit the beach! After our wine/pisco tours, Guillermo and Patricia deposited us at our hotel in Huacachina, which is an oasis a few miles from the city of Ica. I have read varying accounts of the legend surrounding the formation of the lagoon. All of them contain a hunter and a beautiful princess. In some, the princess is surprised by the hunter while bathing and runs away, with her bathwater forming the lagoon. In others, she is admiring herself in a mirror and when she sees the hunter, she drops the mirror, which shatters and turns into the lagoon. Sometimes, she ends up a mermaid in the lagoon, and sometimes any men who swim in the lagoon drown. 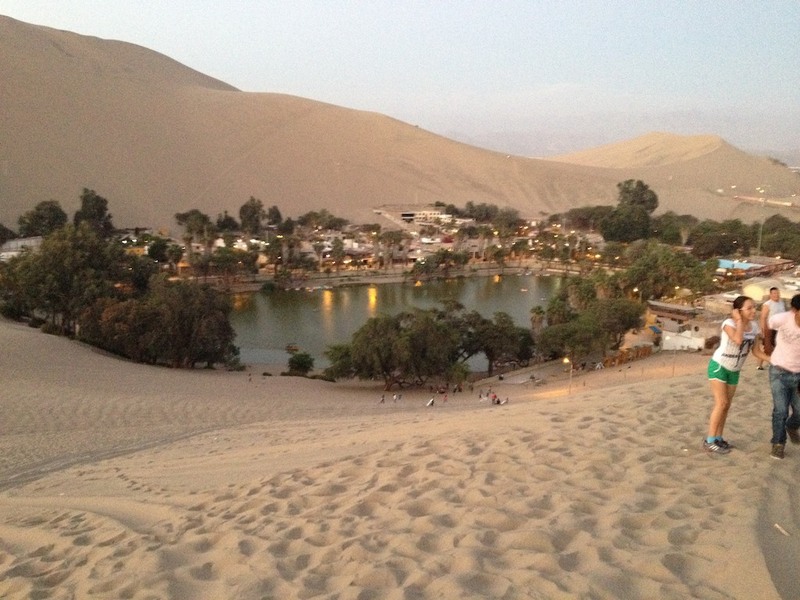 In any event, Huacachina is a unique sight to see. It takes about all of 5 minutes to walk around Huacachina and the main attractions are sand boarding and dune buggying. After sleeping off the wine/pisco tastings, we were game for a dune buggy ride. Patricia had introduced us to a guy she said worked at a reputable establishment, so we headed over there and paid our 80 soles (about $30). After we filled out a sheet with our name, age and nationality – but no waiver or disclaimer language – we followed the guy around as he negotiated with the drivers of various dune buggies to take us for our ride. Ultimately we ended up with Jesus (and who doesn’t want Jesus at the wheel? ), but only after he asked us directly whether we had only paid 80 soles. Apparently Jesus thought the first guy could have bilked the gringos for more. As we were first in the buggy, we had our choice of seats and Matt chose the front row, which brought back memories of my cousin Sharon coercing me into the front row on Space Mountain. We careened around town and pulled up at a hotel where we picked up the rest of the passengers, who were Peruvians at least 25 years younger than us. No matter, they loved that we were Americans and the guy in green immediately started to speak stilted English to us as his embarrassed girlfriend shushed him. We smiled, told her it was fine and chit chatted with the guy. Our celebrity was apparent when at the first stop they insisted on having us in their photos. We zoomed up the dunes and I realized it WAS Space Mountain and these dunes were huge! The pictures don’t do them justice. I screamed like a ten year old and had to close my eyes when we swooshed down some of the higher dunes. It was exhilarating, and though I did question our wisdom, at least we were wearing seat belts. It wasn’t just a roller coaster ride; it also was a sand boarding expedition. After about 15 minutes of bombing around, Jesus stopped and handed out snow boards. Matt was game, but I initially declined as learning to sand board did not strike me as ideal for my fused spine. Once Jesus started explaining the concept to the other passengers, and I realized that by sand boarding they really meant sledding, I was in. (Fused spine be damned; who wants to be the old fart? Although one girl declined the fun.) As none of these kids had ever been snow sledding, Matt quickly showed off his Midwestern roots and zoomed right by them. After an hour of alternating between tearing around the dunes and stopping to sled, we ended at a ginormous dune. I took one look and said no way. But when I realized that the alternative was to ride down in the buggy, I opted for sledding. Poor Jesus. After being an excellent guide and a lot of fun, the day ended on a low note when we ran out of gas as the sun was setting. Again, I questioned our wisdom as we sat there, in the darkening desert, with Jesus futzing with the engine. Other buggies came by and the drivers appeared to be ribbing him, but eventually one stopped and another hot negotiation ensued as Jesus bargained for some gas. A price (we think 5 soles) was agreed upon and they siphoned gas to our buggy, allowing us to see the sun set over Huacachina. All’s well that ends well, and I’m grinning as I remember the sheer fun we had. But I still won’t go on a roller coaster! Neither Matt nor I fear flying, so we didn’t mind the small plane although it was a little disconcerting to realize the co-pilot was being trained. But there was even complimentary snack service, which is more than most major airlines provide these days. 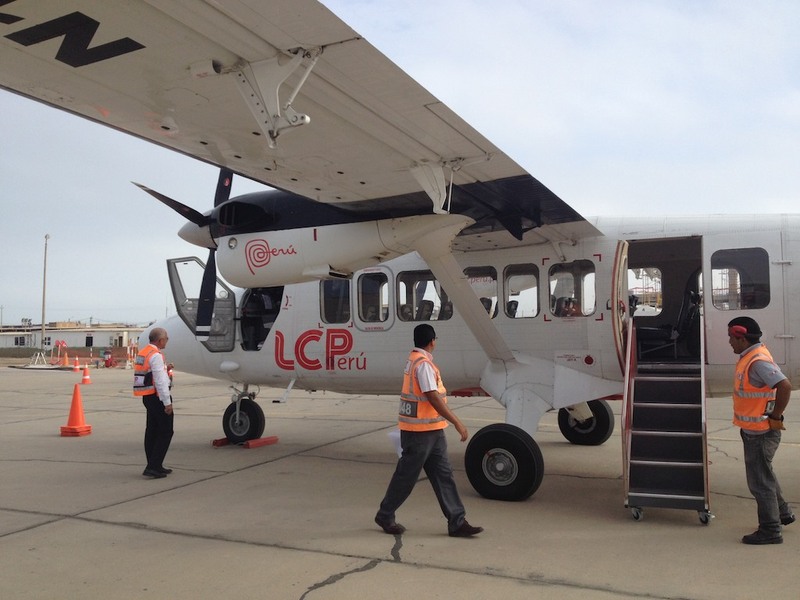 We landed in Pisco (which is both a place and a liquor) and were picked up by our driver, Guillermo, and our English-speaking guide, Patricia. While we were originally going to go to our hotel in Huacachina for a few hours and then have our wine/pisco tours in the afternoon, the plan changed and we were at our first winery stop, Vista Allegre, by 9:30 am. We were hoping to find some good Peruvian wine on this trip, but our tours confirmed our fears: there is no good Peruvian wine. There is some okay, everyday wine, but nothing amazing. We also learned that Peruvians are incredibly proud of their pisco and are in a feud with Chile over the right to call their respective liquors pisco. In early October, the El Salvador Supreme Court ruled that only Peru may use the name pisco. I am not sure whether that means anything outside of El Salvador (the way only France can market champagne), but the Peruvians were pretty happy and proud to share the news with us. Our drive was surreal; there was no confusing our location with Napa. We were in a desert with huge sand dunes, yet Ica is also an agriculture area due to its sunny climate. Check your asparagus – it may be from Peru. Other crops include cotton, potatoes, olives and, of course, grapes for wine and pisco. As a result of the agriculture, transplants from the jungle, where there is no real industry to support people, migrate to the area to work in the fields. We saw many odd straw hut communities in the middle of nowhere that didn’t appear to be inhabited. We were told they are “planned invasions” – transient communities that come and squat on the land and eventually own it if the government cooperates and no landowner throws them off. The process is very political and some locals greatly oppose it. It sounded very odd at first until we thought about Western migration in the US. After our tasting, we headed to our next stop, Tacama, the oldest winery in Peru. We were excited to go there as Tacama Gran Tinto is one of the few Peruvian wines we drink and we were hoping to try some of their other reds in an effort to find a better one. Unfortunately, the Gran Tinto was the best we tasted. The grounds at Tacama were beautiful and the traditional caballero/señorita dance was a nice touch. Our final stop was a smaller producer, Bodega El Catador, which is on a compound of several wineries and restaurants owned by different members of a family. The tour showed the traditional way of making pisco, complete with ceramic casks. It was very interesting and we made our only purchase of the day: a bottle of fig-infused pisco. It has a creaminess reminiscent of Baileys and is quite tasty. Or maybe it just seemed tasty because we were up at 5:00 and wine/pisco tasting by 10:00 am! Next up: We hit the dunes!